The Tories Industrial Strategy is in tatters – we need a Labour Government to rebuild UK manufacturing. 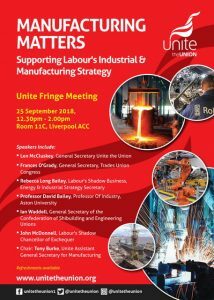 Full house, standing room only for Unite’s Manufacturing Matters Fringe Meeting at the Labour Party Conference. The UK stands at the crossroads. The country faces the prospect of crashing out of the European Union inflicting untold damage on our manufacturing industries if we are faced with no customs union or access to a single market. Along with confusion on membership of European agencies, the UK could see a breakdown in ‘just in time’ supply chains in industries such as automotives, aerospace and engineering, with companies deciding not to back new investment in new in their businesses here and in our infrastructure. Unite has warned of backlogs of lorries at our ports (not just Dover) with lorries waiting to cross into the EU and into the UK as well as the damage caused by our loss of membership of EU agencies and regulatory bodies in civil aviation, nuclear, pharmaceuticals and medicines which could be ended or frozen until they are sorted out – causing massive uncertainty and anguish for travelers, our NHS, patients and services. Unite has been warning of the dangers of a no-deal Brexit or a bad deal Brexit and its consequences for industry for two years. But the fact is that hard line Brexiteers do not really care about manufacturing and industry. One employer’s organization recently told me the PM and the majority of the cabinet ‘do not get manufacturing’. Another said that at a recent meeting with Government ministers were still parroting the mantra that everything would work out – despite the recent warnings comments from manufacturing companies, trade unions and regulatory bodies. Unite has also argued strongly the UK will also need a robust industrial strategy – one which will defend our industries and stop a slide into a low wage, low skill precarious employment, service economy. As the UKs biggest manufacturing union we thought hat the Government just may have heeded calls to prioritise manufacturing and with it develop a robust Industrial Strategy. No such luck! What we heard instead were sound bites, about ‘protecting manufacturing’, ‘ensuring investment’, ‘higher productivity’, and ‘ending skill shortages’ – remember the Northern Powerhouse? Unite had already developed our new manufacturing strategy and we worked with Labour on key policy commitments on industrial strategy. But we heard little from the Government. When the Government document (after lengthy delays) did get launched a year ago, it actually looked ‘substantial’. But it was big on type and had lots of photographs and there was little of substance. Since then, consumed by Brexit any pretence of an industrial strategy has been abandoned. On almost every occasion they have had a chance to demonstrate they have a joined up strategy they have bungled it. Examples include Bombardier in Northern Ireland, when it was under attack from Boeing who were seeking tariffs against the C series passenger jet. The Government dispatched the Trade minister Liam Fox to the USA and fearful of upsetting Donald Trump, the government waved the white flag and it was left to unions in the UK and Canada to never give up, lobbying hard in the USA and in the EU. Eventually the US trade authorities threw out Boeing’s claim. On Trump’s Steel and Aluminum tariffs again they dispatched Dr. Fox to the USA who came back (again) empty handed. It was left to the EU to confront Trump as Unite had initially proposed to deal with the issue of dumping and the global overcapacity in production of steel and aluminum. Security printers DeLa Rue, lost the contract to print and manufacture UK passports after ten years of no security issues at all – the government offered little help in the way of help. At GKN, a company that traces its engineering history back 250 years – it took the Secretary of State 57 days before he called in the eventual purchasers Melrose – a City financial company to seek assurances from them about the future of the business. This was against a background of nobody wanting the deal, (except Melrose and speculators). The takeover was opposed by the workforce, the aerospace and the automotive industries, Labour MPs (and some Tories) and yet it was allowed to go ahead in the full knowledge Melrose would split it up and sell parts of the business on. Just five months on – parts of the GKN business are going up for auction and our members work is being transferred out of the UK. We are lagging further behind Germany, the USA and China on research and development into electric vehicles and the much needed technology and infrastructure. May’s announcement of £106 million investment is peanuts – and leaving it to the market to fund the rest is nonsense. The three Royal Fleet Auxiliary Ships on order that should be built in the UK – using UK steel and technology could now be built abroad – Jeremy Corbyn has already stated under Labour they would be built here in the UK. Plans for the construction of the revolutionary Swansea Tidal Lagoon were simply scrapped. The Apprenticeship Levy designed to get 3 million new apprentice starts by 2020 is now at breaking point and failing badly. Any Industrial Strategy worth the paper it is printed on must consider the long term, big picture including infrastructure investment in aerospace, science and automotives. This includes a just transition to electric vehicles and future mobility with sustainable energy needs. Protecting our foundation industries such as steel and deal with dumping of good such as steel, tyres, ceramics on the global market – after Brexit day the UK’s Trade Remedies Authority who would deal with dumping cases will not be up and running for two years. We need to support small and medium supply chain companies – as they do in Germany with their Mittelstand programme and good quality gold standard apprenticeships. It also means changing the rules of the game by reforming the takeover code to promote long-term thinking – and end short-termism and asset stripping such as we saw at GKN. It means giving workers a strong, collective voice, by extending collective bargaining and a real voice at work. We need a government that will use every lever at its disposal to support, which will defend and invest in UK industry and in decent jobs – jobs for the many not the few. We need Labour in power to deliver the industrial strategy our country needs and deserves. 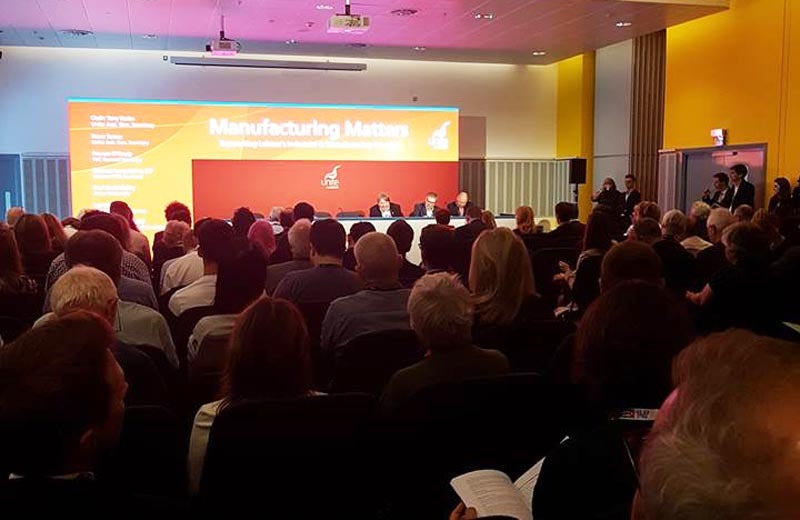 First published in the Morning Star September 25 the days of Unite’s Manufacturing Matters Fringe Meeting at the Labour Party Conference. This entry was posted in Economics, Labour Party, Media, Politics, Trade Unions, Trades Union Congress, Unite The Union, Workers Uniting. Bookmark the permalink.